1. Does the company have a clear and consistent goal and strategy? Its long-term and high level strategy for delivering transport services is to focus primarily on providing public transport via busses, trains, trams and coaches. 2. Does the company have an obvious core business? YES – Stagecoach’s core business is the provision of UK bus services outside of London. The company has had varying degrees of success in expanding beyond this core into air, rail and international bus markets. The financial ratios below are taken from this free investment spreadsheet. 3. Does the company have an above average record of growth? As the chart shows, Stagecoach has obviously grown both quickly and consistently in recent years. 4. Is the company more profitable than average? 5. Does the company have conservative financial obligations? 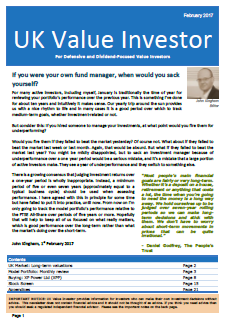 NO – The two main financial obligations I track are total borrowings and defined benefit pension obligations. I compare both of them against a company’s average earnings in order to to assess the risks they post to the business if events take a turn for the worse. It operates in the cyclical Transport & Leisure sector but in reality the company is defensive in nature, as is its core UK bus market. Clearly, Stagecoach breaks that rule of thumb, so I would not invest in this company unless there were some exceptional mitigating circumstances. Stagecoach also fails this test, which again means I would only be happy to invest if I found evidence that this large pension scheme does not represent a material risk to the company’s future. 6. At the current share price, are its valuation ratios better than the market average? NO – The company’s shares have performed well in recent years, gaining more than 150% from their low point in the financial crisis of 2009. This above average valuation indicates that investors are expecting Stagecoach’s past record of superior growth to continue into the future. 7. Do the company’s Key Performance Indicators (KPIs) focus on relevant factors beyond revenue and EPS growth, such as profitability, leverage, liquidity and investment? NO – Its main KPIs are 1) adjusted earnings per share growth (targeting growth in excess of inflation), 2) passenger or revenue growth per division (targeting positive growth) and 3) safety and service delivery (targeting reduced accidents and several different service delivery factors such as punctuality). I don’t like to see EPS growth as the only measure of financial success as it incentivises companies to retain and invest profits even at unfavourable rates of return. 8. Is the company in the leading group in terms of market share within its chosen markets (i.e. economies of scale)? YES – Most of Stagecoach’s profits come from its UK bus business where it has around 23% of the UK bus market outside of London and 15% within London. 9. Has the company had the same core business for many years (i.e. economies of experience)? YES – It has operated in the UK bus market since it was founded in 1980. 10. Is the company free of “bold” projects which, if they failed, could push it into a major crisis? YES – Stagecoach does not appear to be undertaking any “bet the company” projects at the moment. 11. Is the company free of the need for regular, large capital expenditures (capex)? NO – Providing public transport is usually a capital intensive business as busses, trains and other infrastructure must be purchased before they can generate revenue. My definition of a “large” capital expenditure is one that is greater than that year’s post-tax profits, and Stagecoach has made large capital expenditures in every one of the last four years. A 90% Capex Ratio falls into what I would call the “normal” range, i.e. between 50% and 100% of average post-tax profits, so by that that measure Stagecoach has “normal” capital expenses. However, I have still answered this question “no” because I think Stagecoach is indeed a high capex company and its Capex Ratio will likely creep above 100% in the next couple of years if its recent spending rate continues. 12. Are revenues generated through the sale of a large number of small-ticket items rather than through major one-off contracts? YES – The answer to this question is “yes” for Stagecoach’s regional UK and North American bus businesses (which generate about 60% and 10% of group profits respectively) but “no” for its London bus business and its rail businesses (which generate about 12% of group profits each). The key difference is the regulatory structure of these markets. The regional UK bus market is largely deregulated and operates primarily on a commercial basis. Any holder of the relevant licence may operate bus services, after registering the required details with the traffic commissioner. The North American bus market is broadly similar. In somewhat simplified terms this means you can get a license, buy a bus, select a route, register the details and then operate on that chosen route. If the route turns out to be unprofitable you can stop running that route or change it. The London bus and UK rail markets are different. In those markets transport companies like Stagecoach bid for contracts (or “franchises” in the rail business) which allow them (and obligate them) to be the sole provider of certain bus routes or rail networks over a fixed period of time. These contracts are fixed-term and typically run for 5 years in the case of bus contracts and somewhat longer for rail franchises. The London bus business is not too much of a problem as Stagecoach currently has around 80 separate contracts, which diversifies away some of the risk of expiring contracts. In the rail business it only has five major franchises so each franchise is a significant part of the company’s rail business. However, around 70% of group profits are generated from the non-contract bus businesses, so its bus and rail contracts do not (yet) pose a significant risk in my opinion. 13. Has the company avoided mergers or large acquisitions in the last few years (i.e. cost more than a year’s profit)? YES – The only significant acquisitions in recent years came in 2013, when an amount equal to 80% of that year’s post-tax profits were spent acquiring various bus businesses in North America. This was smaller than my definition of a “large” acquisition, which is one that exceeds 100% of that year’s post-tax profits. 14. Has the company avoided acquisitions that have little to do with its core capability? YES – Any acquisitions of significant size have been in closely related businesses, such as the North American bus businesses in the previous question. 15. Does the company operate in defensive markets? YES – Stagecoach is listed in the Travel & Leisure sector which is defined as cyclical. However, in reality Stagecoach is a defensive company as its core business of providing bus and rail transport is relatively insensitive to the ups and downs of the economic cycle. 16. Does the company operate in markets where the pattern of demand (whether cyclical or defensive) is expected to stay the same? YES – Although technology is gradually changing the way that people interact with and pay for public transport, I see no evidence of a major shift in the type of demand over the medium-term. 17. Does the company operate in markets where demand is expected to grow? NO – The company is optimistic that it can drive a “modal shift” away from cars and towards public transport. However, looking at reports such as Transport Statistics Great Britain 2014, it is not obvious that such a shift is likely, nor that there will be continued growth in the number of miles travelled per person in the UK. 18. Does the company generate most of its profits from products or contracts that do not need to be replaced in the next 10 years? YES – Although the company relies on bus contracts and rail franchises to some extent, the bulk of its profits come from the sale of individual bus tickets outside of London. While individual busses may need to be replaced, the service of transporting people by bus does not. 19. Does the company sell differentiated products that do not compete purely on price? YES – The bulk of Stagecoach’s profits come from its UK regional bus business, which operates in a largely deregulated, “non-contract” market. However, despite these markets being deregulated it is often true that bus operators are able to maintain monopolies, or near-monopolies, over the bus services in certain geographic areas. I’ll cover this in a bit more detail in the questions on competitive advantages. 20. Is the company relatively immune to commodity price movements? YES – Although petrol and diesel are major expenses for the company, the impact of oil price movements on revenues and profits is not particularly strong. For example, the company showed no significant impact, either positive or negative, after the recent large falls in the price of oil, petrol and diesel. Fuel price hedging – The company hedges the cost of fuel into the future so that it has some degree of certainty over how much its fuel will cost over the next year or so. This helps to smooth out the impact of falling or rising fuel prices. Positive and negative impacts – When petrol and diesel prices fall, Stagecoach’s fuel costs fall, which will boost profits. However, falling petrol and diesel also make cars cheaper to run, so some travellers will choose to travel by car rather than by bus or train, which will reduce revenues and profits. 21. Does the company have an expected rate of return on investment (ROCE or similar) of more than 10%? NO – Profitability is measured in terms of growth in earnings per share and in terms of operating margin. No specific goal for rate of return is given. 22. Does the company have any intangible asset advantages (e.g. brand names that command pricing power; patents; regulatory barriers)? NO – Although the Stagecoach brand is well know, I do not believe it gives the company any ability to raise prices higher than its competitors. In the London bus and UK rail businesses there are regulatory barriers, where the company is effectively granted a monopoly to run particular routes for a set number of years. However, even in these cases a mix of competitive tendering, government price controls and substitutes (other routes, cars, walking, etc) seem to keep profit margins at fairly normal levels. In the company’s core UK regional bus business it does not seem to have any intangible advantages. 23. Does the company gain an advantage from the effort required for customers to switch to another supplier (e.g. bank accounts or computer software)? YES – In my opinion there are significant barriers to Stagecoach’s customers switching to alternatives. There are often no alternatives to a particular bus or train route which would not involve fairly substantial costs in terms of time and/or money (when I used to commute into central London I certainly would not have wanted to switch from using a train to a bus as the journey time would have grown from 30 minutes to several hours). 24. Does the company have a network effect, i.e. becomes more attractive as more people use its services (e.g. Facebook, eBay)? NO – In my experience public transport becomes less attractive as more people use it. 25. Does the company have any durable cost advantages (e.g. unique location, unique low cost source of raw materials, greater scale)? YES – Although I have answered “yes”, the cost advantages I’m thinking of are local in scope and do not extend to the whole UK or to international markets, unless Stagecoach acquires other companies that have these local advantages. The cost advantage relates to the use of large, expensive and fixed infrastructure, primarily the bus depot. In a given area there will be one optimal location for a bus depot. That location will be the right size and in the right place to allow a sufficient number of busses to access the most profitable routes in as efficient manner as possible. The company that has the most optimal depot(s) in an area owns a unique and uncopyable asset which can provide a durable cost advantage, if used effectively. If a competitor tries to compete in that area the company with the best depot(s) can lower its ticket prices to below its competitor’s operating costs, forcing the competitor to “leave town”. This creates local monopolies or near-monopolies, where the largest one or two providers hold the lion’s share of the market. This feature is known within the industry so most transport companies don’t even bother to compete against a competitor in an area where they know they cannot win. As a result, prices can be higher than they would be if competition was rife. There is some pressure from government bodies to expand the use of contracts or franchises outside of the London bus market, which may increase competition and reduce returns on capital for service providers. For more on this topic take a look at this government review into competition in the local bus market (pdf). 26. At the current share price are the shares closest to “good value”, “fair value” or worse? GOOD VALUE – At 400p Stagecoach is the 25th highest ranked stock on my stock screen, out of 230. That is well inside the top 50 which is the cut-off for my definition of “good value”. Generally I only buy shares below their “good value” price and sell shares at (and often below) their fair value price. 27. Given all of this additional information, is the company’s use of leverage conservative enough? NO – As I mentioned earlier, I would only consider investing in this company if there were strong reasons why its large financial obligations were unlikely to become a problem. 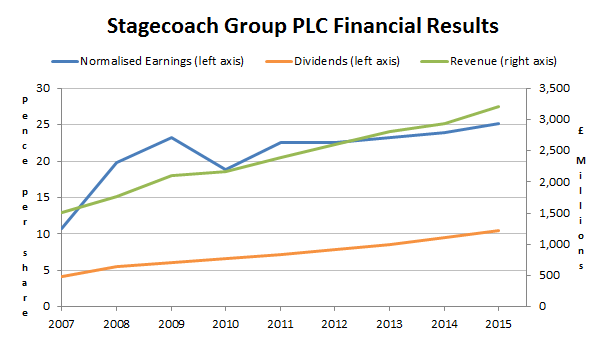 Although Stagecoach’s core business does appear to be very defensive, with strong market share and competitive advantages, I still think its balance sheet is a serious weak spot. 28. Are the odds of this company running into major problems acceptably low, and why? NO – Much like my review of Rolls-Royce last week, Stagecoach appears to me to be a fundamentally good company with a potential ticking time bomb strapped to its back. The time bomb is its large financial obligations in the form of almost £800m of borrowings and over £1,400m of pension obligations. These obligations may not be a problem today, but if the company’s profits fall, or if the economy enters an inflationary phase (leading to higher interest rates and higher capital expenses), that situation could change quite quickly. 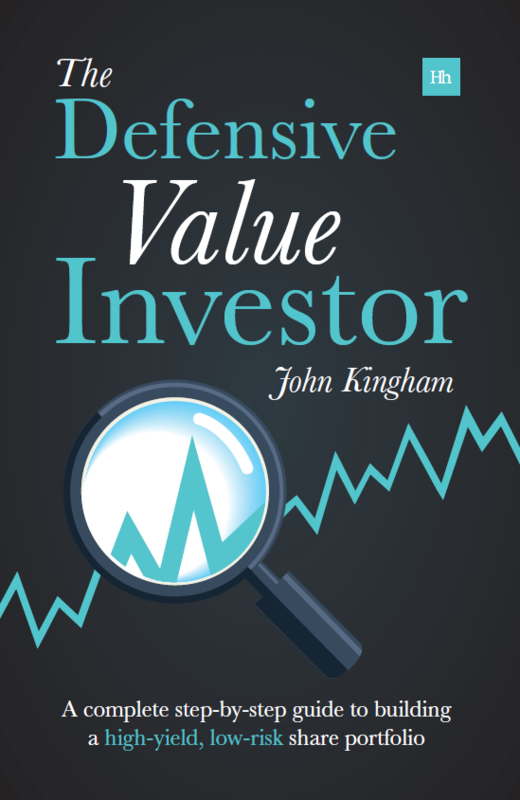 Stagecoach looks like a very successful, very defensive company and its shares are among the most attractively valued in the market (according to my valuation methodology). However, it has very large financial obligations, to the extent that I would not invest until the company reduced its borrowings and offloaded most of its pension obligations. I must admit I have not looked at the big transport providers in the UK for a while. Last time I did neither the two “main” ones for me (Stagecoach and FirstGroup) looked attractive and neither did National Express. I missed the debt obligations of Stagecoach. But it is something which looks worrying. My main concern was their ability to retain (or at least retain as profitable and customer-friendly) some of their contracts in the rail arena. It will be interesting to see whether they address their debt obligations in due course. I agree that they should (along with the other transport companies). It is a looming threat. Hope you’re well. FirstGroup was one I avoided a couple of years ago for more or less the same reason and it then subsequently suspended the dividend. So while these companies are defensive, they’re not immune to being over-leveraged. I understand that they require quite a lot of debt in order to fund the purchase of new busses and so on, but there must be limits. I would be interested to know how much of their revenue is from Government support for free bus passes for over 60’s. I understand that this costs Government over £1bn per year. If this concession goes the same way as free tv licences could this be a real threat to bus operators. The situation for London is different, where it looks like operators are paid a contractual fee by Transport for London instead of taking fares as revenue directly, so in that case the issue of the elderly isn’t relevant (although I could be wrong, I haven’t looked at it in detail). So your suggestion is not unfounded. If 25% of the UK regional bus revenue vanished (i.e. payments for the elderly) then that would be 25% of 60% of total revenue, which is 15% of total revenue. I guess that would be a worst case scenario, but it is not an insignificant sum.